“Don’t be fooled. Floods can happen anywhere and everywhere. 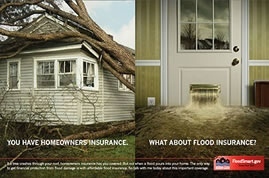 Most importantly, it is NOT covered by homeowners insurance. From flood plains to flashfloods to mudslides, your home insurance policy will not protect your home or contents from a flood or flood related event. This concept is starting to get pushed to the forefront of public knowledge, and yet few individuals have the protection they need from the devastating effects of a flood. This is mainly due to the belief that, while everyone may be at risk, the prevalent perception is that flood insurance policies are extremely expensive. This couldn’t be further from the truth. In fact, The National Flood Insurance Program has adopted Preferred Risk Policies for low to moderate risk properties starting out as low as $119 per year." 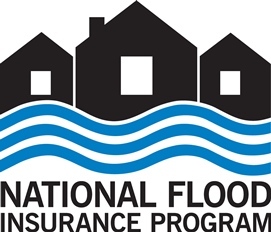 THe National Flood Insurance Program (NFIP) is managed by the Federal Emergency Management Acency (FEMA), a component of the U.S. Department of Homeland Security (DHS).